Can You Ride A Zebra? How Long Do Zebras Live? 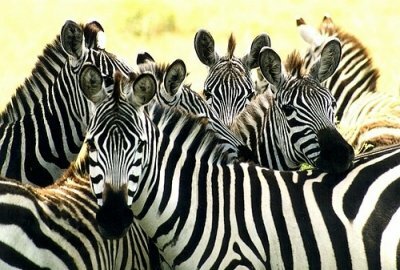 Many individuals can recognize a zebra just by looking at it. The unique black stripes on a horse-like frame are identical with visions of the African safari. Zebras usually have white and black stripes on their whole body and the stripes are distinctive in nature to each individual. Additionally, zebras normally have a Mohawk-like mane that stands erect on their neck. At one time, zebras were generally considered to be white animals which have black stripes. This is because some zebras have white underbellies. However, embryological evidence indicates that the zebra’s background color is usually dark and the white stripes and bellies are add-ons. The stripes are normally vertical on the forequarters, neck, head and the main body with parallel stripes on the rear as well as the legs of the animal. There are three main species of the zebra. The one that is very common is the Burchell’s, or plains zebra. The remaining two species are the Grevy’s and the mountain zebra. The Grevy’s species is named for a 1880s French leader who got a zebra as a gift. This species of zebra cohabitates with livestock for resources like water since agricultural land has taken over a greater part of its natural habitat. The statistics of wildlife indicate that the Grevy’s zebra now totals approximately 2,500 in existence compared to few years ago when 15,000 existed. Grevy’s zebras are mainly found in Northern Kenya. Burchell’s zebras usually live in the savannas of East Africa, in landscapes ranging from grasslands to woodlands. Mountain zebras live in Southwestern and Southern Africa. Zebras sleep while standing and they only sleep other zebras nearby to warn them of potential predators. They communicate with each other with whinnying and high-pitched barks. When they are tense, they also snort. When zebras sense a predator, they will bray or bark loudly.